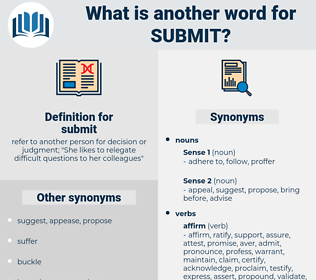 What is another word for submit? refer to another person for decision or judgment; " She likes to relegate difficult questions to her colleagues"
puts in the hands of. nominations, requirements, Gives, hosts, outputs, send, Presenting, present, presents, transmit. send, Presenting, present, transmit, transmittal. Supplied, dispatched, produced, mailed, Wished, posed, arranged, Deployed, Referred, tested, Returned, handled, dropped, Got, send, Presenting, present. formulated, are, AM, Lodged, send, give, present, pose, testify, contend, transmit, represent, notify, assert, circulate, transmittal. 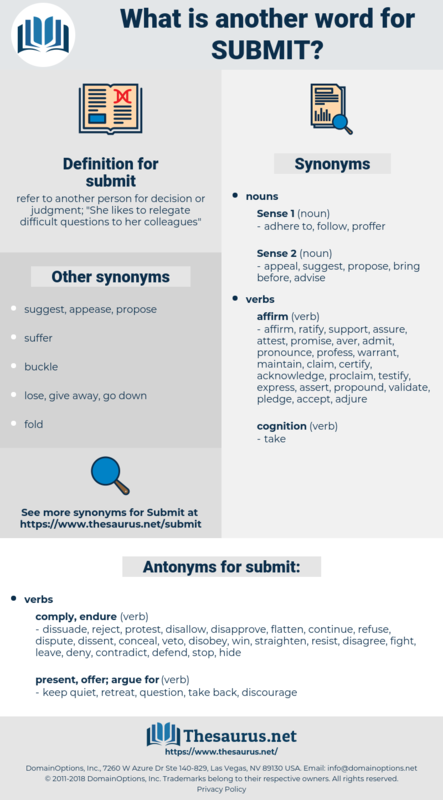 lay, Brought, nominate, Deposited, subdue, succumb, send, give, impose, Presenting, present, presents, publish, pose, testify, transmit, represent, adduce, notify, assert, commit, comply, participate, solicit, circulate, consult, announce. dissuade, reject, protest, disallow, disapprove, flatten, continue, refuse, dispute, dissent, conceal, veto, disobey, win, straighten, resist, disagree, fight, leave, deny, contradict, defend, stop, hide. keep quiet, retreat, question, take back, discourage. confront, thwart, battle, meet, bridle, stand, inhibit, hold off, constrain, restrain, triumph, face, beat, stifle, object, combat, counter, buck, overcome, endure, check, contend, prevail. Still, as you say, it would not be fair to submit her to a suspicion of danger. Why not give herself up to him, submit to the will of another, make it her will? pass on, return, relegate, submit, give.